Living room lighting has evolved greatly from the traditional single ceiling light with flared white shade. Nowadays households demand something more than just the traditional single bulb hanging from a central ceiling point. Households like you and I want designer living room lighting that exudes sophistication, taste and functionality. We have searched over 100 designer homeware and furniture websites to bring you the TOP tripod floor lamps for 2017 and what we believe will feature well into 2018 and beyond. Click on any title or main image to view more details on an item. This particular tripod floor lamp is a very popular lighting solution that is classy and sophisticated. One of the main attractions of this piece is that the indirect, reflected light is not bright white, but more of a copper light that is warm and inviting. The beautiful thing about the Alfred is that you can adjust the main beam to shine (against the wall or up to the ceiling) and also adjust the shutters to create an almost bespoke dimming effect. The Madison is a very classy tripod floor lamp. The large shade ensures that the majority of its light shines down, reflects gently against the dark wooden tripod to give you a gentle warm glow. This particular light exudes sophistication, minimalism and a requirement to do away with fuss and bother. A simple classy tripod floor lamp that will fit into any home decor trend. This particular lamp, as well as resting on a traditional tripod is also an anglepoise, which means that you can direct the light towards a ceiling or wall, or use as a dedicated reading light. If you prefer a modern tripod floor lamp that doesn’t have shutters, but can still be positioned into any angle then the Metal Spotlight Lamp, might just be for you. A tripod floor lamp does not need to have just ONE light. The Dexter, funnily enough is one of the only tripod lamps that has three lamps. the beauty of the Dexter is that the three shades (white, black and orange) fuse together beautifully to give you a distinctively warm light from three different bulbs. From our 150 odd partners, these are the best selling Tripod Floor Lamps in the home furniture world, today. We believe that, because they are so popular at the moment, they will stand the test of time and remain very sought after into 2018 and beyond. When it comes to modern WOW, the Asoka is here to please. 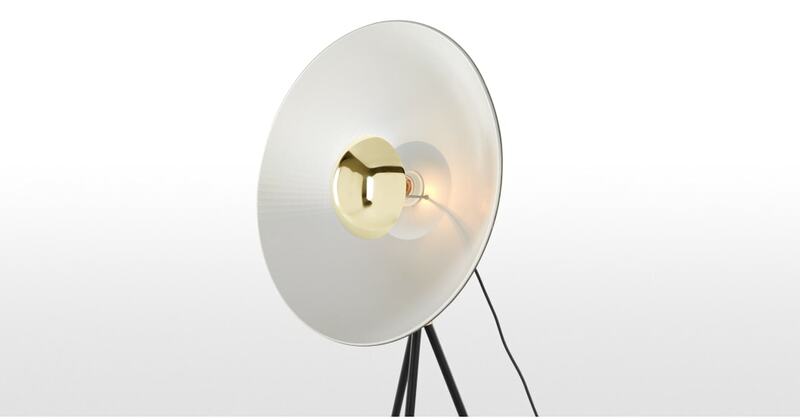 The silver reflective shade will diffuse light gently around your living room or bedroom. 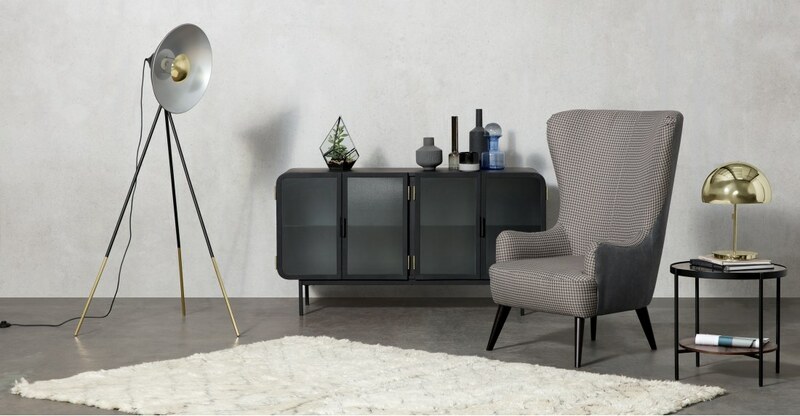 If you love mid-century furniture then you will love the west eml. With three independent arms that can tilt and turn as you like it will give you all the light you need in all the right places.